The last weekend of August was my hubby’s grandma’s 80th birthday party. 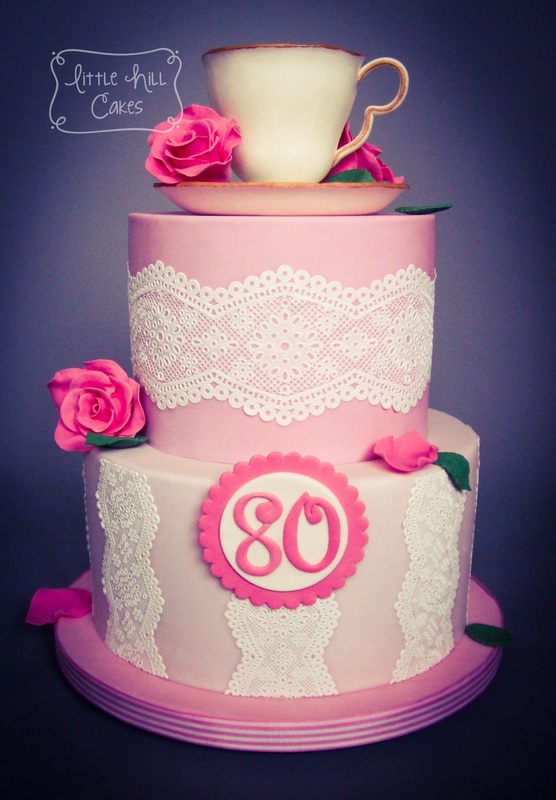 Her daughter organised her party with the theme of an ‘Old English Tea Party’ and asked if I could make the cake. A few months earlier I’d got Shawna McGreevy from McGreevy Cakes‘ teacup and saucer tutorial, so I thought this was the perfect opportunity and theme to try it out. 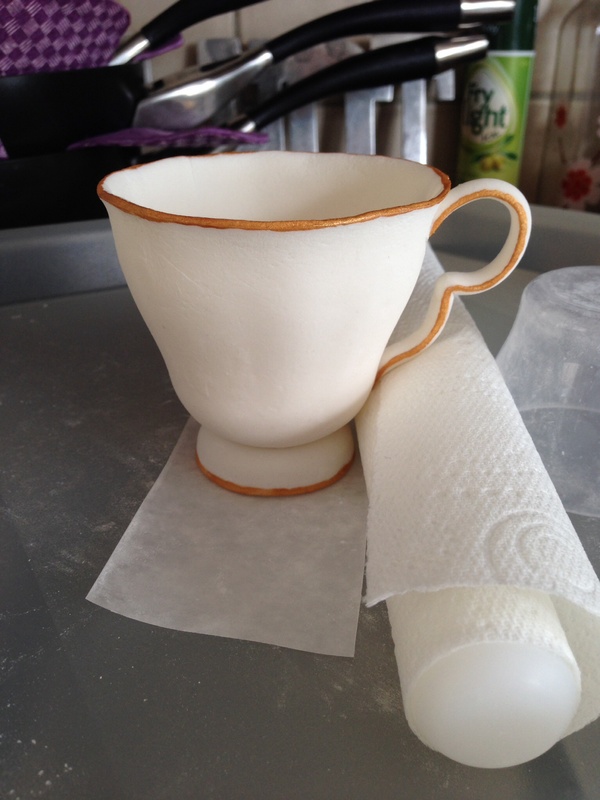 I’d watched a bit of the tutorial when I first got it, but made the mistake of not watching it again until right before I started making the teacup! I borrowed a china teacup and saucer from someone and then when I started watching the tutorial, one of the first things Shawna says is “the reason I’ve told you to bring along two teacups is…” So I ended up hunting round my kitchen for something to use in place of the extra teacup and ended up using a baby bottle lid… If you want to purchase her tutorial I’ve put t he link to her Tutorials Shop here. She very kindly shared the post I’d put on Facebook of my finished cake, and put the price of the tutorial down to $5 (£3). I can thoroughly recommend it! She goes on to show you how to hand paint the teacup and saucer, but unfortunately I didn’t have enough time to try that, other than painting the edges and handle with edible gold paint. I love her tutorials and her blog – she is not only very talented, but very graciously shares loads of her tips and tricks, as well as being hilarious with it. 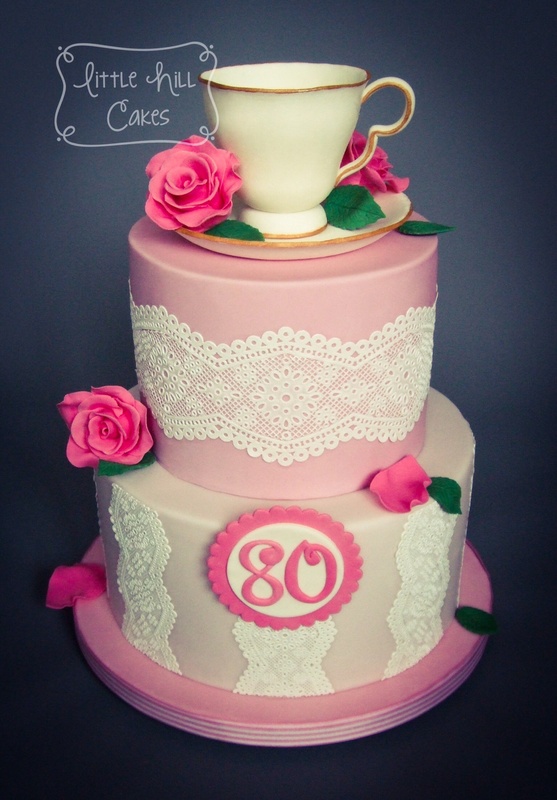 If you love cake decorating then go and check her website out! Anyway, back to the cake! I decided to try cake lace for the first time as I thought the lace effect would work well with the theme. I have to say it wasn’t quite as easy as it looked on the YouTube video I’d seen… On my first go I wiped a bit too much off when I scraped the mat level, and so there were gaps in the intricate design and it fell apart. The next attempt I didn’t scrape enough off, which meant the detail of the design didn’t show up enough. So onto attempt three! I spent more time checking the lace on the mat before I put it into the oven to set, to make sure that every part of the design was covered, but that there was no excess. Success at last!!! The cake lace was really easy to handle and cut once it was set, so that made doing the vertical stripes on the bottom tier very simple. I’d only made roses once before for the Jug of Roses Cake I did in June. 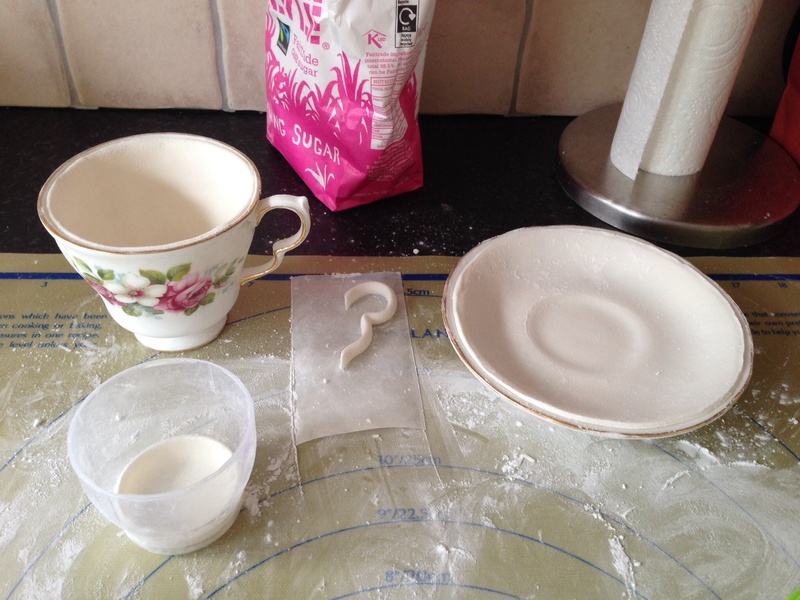 This time I wanted to try using gumpaste to make them rather than flower paste. I found it easier to work with, and rather than use petal dust like I did last time, I coloured the gumpaste first as I wanted a deeper shade of pink so that it would stand out from the two tones of lighter pink fondant that the cake was covered in. 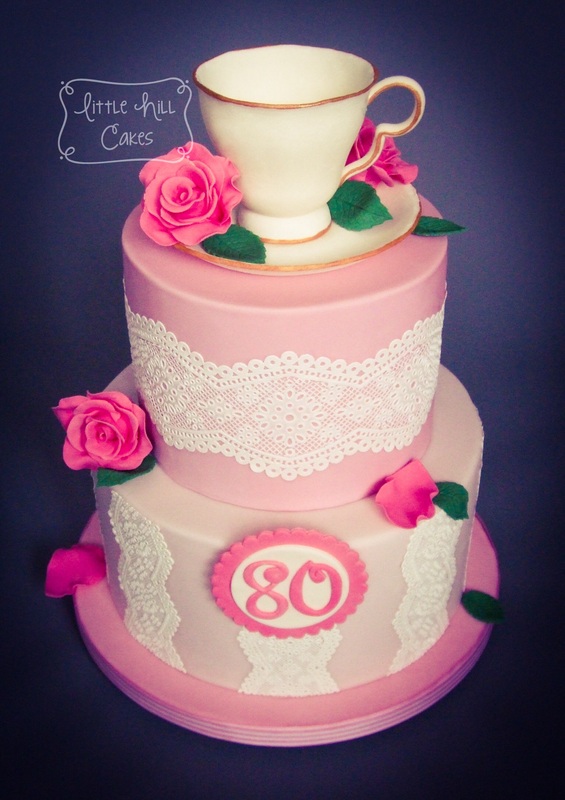 My hubby’s grandma was thrilled with the cake and said that she was going to keep the teacup, saucer and roses as keepsakes from her party. I think it’s one of my favourite cakes so far, and it was lovely to see how much she liked it!